In this week's Martin and Sylvia's Nature School story, "Trusting the Forest," when Martin’s friend Alexander tells him he doesn’t want his father to come to the Goose-eye Wilderness School evening program, Martin is curious: why not? But that evening, Martin can see that Alexander’s father is very protective and nervous. Luckily, Troy, one of the apprentices, has the perfect story to help. We are joined today by our Nature School contributor Dawn, of Mud Puddles to Meteors, who gives us tips for taking a night walk. Whether walking along the lakeshore while camping or around your neighborhood on a summer evening, a nighttime walk can awaken the senses and make even the most familiar places come alive in a whole new way. As humans we typically rely on our sense of sight more than any other sense. We are visual animals that are made to carry on with life during the day and hunker down for much needed rest and recovery at night. All the more reason to get out of our natural rhythms every so often to experience the world from a different perspective, helping our other senses take over and come alive. At night the big sounds of the world die down and a quite falls over the landscape. That sounds like something right out of a story book, right? To a certain degree it is true, but you will quickly discover on your night walk that while the hustle and bustle of human activity has quieted down, the creatures of the night are just getting started and sometimes they can make quite a ruckus, for those who are listening. While you are out listen for frogs peeping, bats on the wing, birds of the night (most are quite quiet), the wind blowing through the tree, insects chirping and buzzing, along with other signs that tell you someone is rustling about. Before you leave you might want to talk about which animals you know about that are nocturnal and how the wind might make things move. You may want to even tell a few stories about nighttime creatures. This will help even the littlest explorer tune in, and dampen some fears that may arise from the sounds you hear. A reminder that even little creatures can make big sounds when the rest of the world is quite is helpful for everyone. Without our vision to help us we have to rely on our other senses and all of a sudden smells become very important. While it is true that even people who cannot see don’t have a heightened sense of smell, our sense of smell can tell us a lot about the world around us and it is really more keen than we give it credit. During your walk tune into how things smell. Smell the bark of a tree, the grass, and flowers you pass by. Do they smell any different than they do during the day? Do they have a stronger smell? Weaker smell? Why would that be? It is also linked strongly with memories. While you are out talk about any smells that remind you of something. A super fun and simple way to learn about the human eye is to see it in action and a great way to do that is to have the kids see your pupil change right before their eyes. To do this simply close your eyes for about 10 seconds then open them while facing a bright light. Your pupils will quickly dilate to adjust to the increase in light and the kids will be able to see them get smaller. If you have someone around with light colored eyes have them do this for a greater effect. The simple explanation here is that our pupils take in light to help us see and when light is low they get bigger to take in more light, and when the light is bright they get smaller to take in less light, very similar to the shutter on a camera. This is obviously a very simple explanation (since there are folks who study the eye in depth) but this will get them started on learning about the eye and who knows… medical school could be in their future because you took them on a night walk. 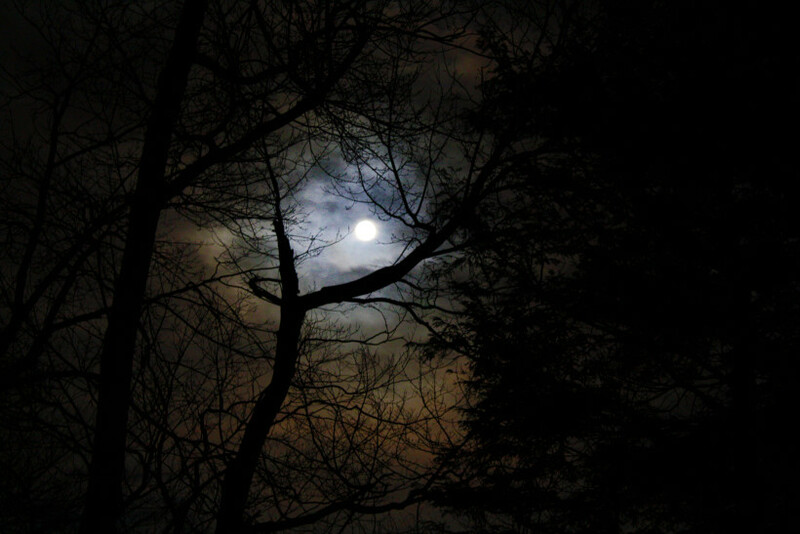 A few simple precautions will help you and yours stay safe during a night walk. This will get you started on your journey to discover the night and make memories that will last. My kids still talk about seeing the stars reflecting off of the calm black lake one night while we were out exploring the darkness. It was brilliant.